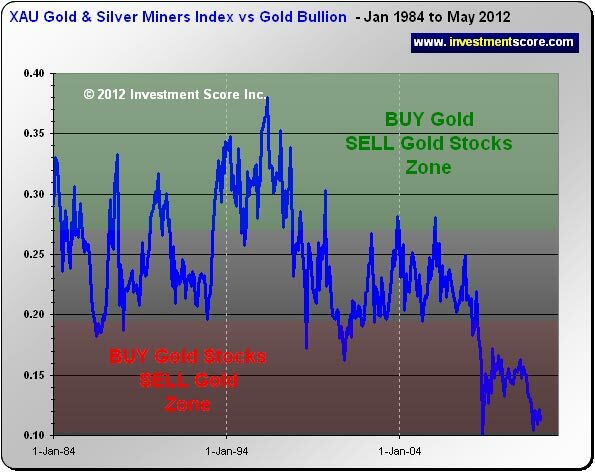 Basic price performance of the precious metals market simply does not match that of other bull markets. Yes silver did rise from about $4.00 to about $50.00 but that is not nearly as impressive as it first sounds. When we compare the price appreciation in the current bull market to other bull markets we can clearly see that there is a lot of room for further upside. The following chart illustrates other examples of bull market price performance. Next, given the quantity of money we have seen printed around the world, we would expect to see even more of an extreme price move than what we have seen. It is true that the price of nearly all commodities has risen significantly, but the metals have barely budged in comparison to the quantity of currency being printed. When we consider the underperformance of precious metals mining companies relative to the metals themselves we certainly do not see signs of a “feeding frenzy mania”. Contrary to typical action in a bubble market, the mining equities have been dismally underperforming the metals as they wait for their turn to grow in value, like Cisco Systems or Microsoft did in 1999. In the above chart when the blue line heads up silver is outperforming mining stocks and when the blue line heads down mining stocks are outperforming silver. 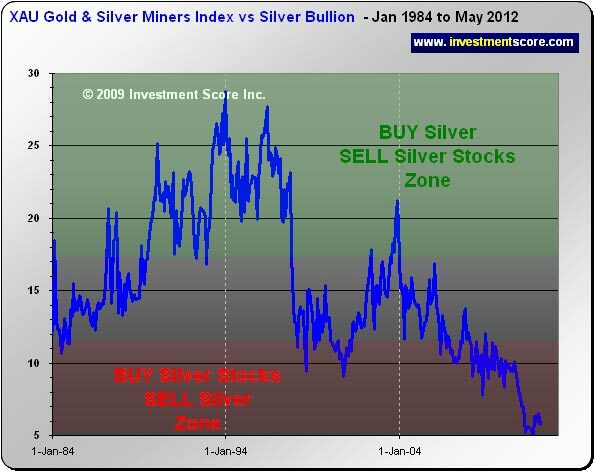 Looking back as far as 1984 we can see how cheap mining equities are relative to the price of silver. 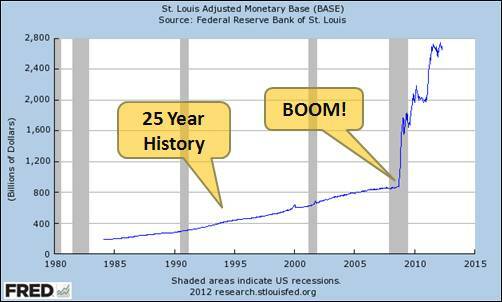 At some point this trend will reverse. In our opinion the bull market in precious metals is far from over, which makes the mining equities very attractive when compared to the metal itself. Why do we want to hear others talk about the bull market being over? We know that the best buying opportunities come when investors feel negative and very pessimistic, because if investors are pessimistic they are not investing, and if they are not investing the market is cheap. When everyone is excited and jumping in with both feet, wet think a wise investor should be cautious and take money out of the market. It is our expectation that a great buying opportunity in precious metals is marked with commentary about the end of a bull market. 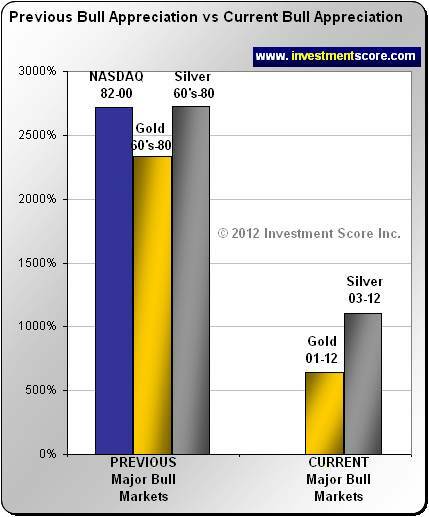 In our view it is positive news to read stories about the end of the precious metals bull market. Finally, we have a set of custom indicators that suggest to us that the bull market in precious metals is alive and well. We were expecting this latest correction and we continue to monitor its progress at www.investmentscore.com. Please visit our website to learn more about our system and to sign up for our free newsletter.